Konungen pekar tydligt ut var glaset skall stå. 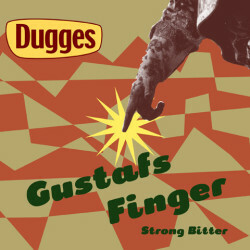 Denna ”Strong Bitter” med klassiska mörka karamellmaltsmakerna har både fyllighet och styrka. Gustaf har ett uppfriskande humlebett där Chinook-, Brewers Gold- och Cascadehumle bidrar med smak och inbjudande arom. UPDATED: MAR 12, 2016 Backlog, early amateur rating! @ Havregatan 201209xx. Bottle from Systembolaget. Malty, caramely, bitter. bottle @ home. Pours a dark amer liquid with a large, thick tan head. Aroma of caramel, bread, nuts, biscuits, slight chocolate & citrus. Similar taste, with dry finish and balanced spicy bitterness. Murky red - amber beer, small pale cream colour head. Palate is light and semi dry with moderate fine carbonation. Malts taste a little oxidised, that tired caramel. Touch of tea. Decent orange on the backend but it’s not hoppy bitter. Finishes semi dry. Overall a sweetish beer, not that bitter a bitter then! Aroma of malt, caramel, some nuts, butterscotch. Flavour is moderate sweet with a light to moderate bitter finish. Nice agreeable beer. Bottle from some Systembolaget. Poured a hazy medium brown with a round white head. The aroma is malt, citrus light hop. The flavour is moderate bitter, light sweet with a light hop bitter, light citrus palate. Medium bodied with soft carbonation. Bottle from the Fyne Ales brewery shop. Pours deep amber with a good cream head. Sweet fruity aroma. The taste starts sweet with caramel, green fruit, apricot and pineapple. The finish has a touch of bitterness. Could do with a bit more punch and body. 330 ml bottle. Hazy copper with tanned head. Smell is malty caramel and a bit bitter. Taste is sweet and roasted malt and caramel. Fruit grass and flowers too. Dry with medium bitterness and low carbonation. Bottle. Dark amber color. Floral aroma with a hint of caramel. Malty sweetish flavor with cookie caramel, red fruit and floral notes. Decent. Really good bottles bitter. Flat and malty, really opens up as it warms. A little caramel a little butterscotch.